Previously our Collection of Canines featured the Boykin Spaniel and Redbone Coonhound two of three newly recognized breeds by the American Kennel Club (AKC) as of December 30, 2009. Let’s get to know the third newest AKC breed, the Bluetick Coonhound, a new member of the Hound group. In the early 1900’s, French hounds such as the Grand Bleu de Gascogne, Porcelaine, Curs, and Saintongeois were brought to America in mass. American breeders, primarily from Louisiana, began selectively breeding these French hounds with their American and English counterparts with a goal of increasing their endurance for hunting. In the beginning of this newly formed breed the Bluetick was considered an English Coonhound, however by 1945 Bluetick breeders broke away to ensure their breed would produce a larger and slower cold-nose trailing dog to better fit their hunting style. To be cold-nosed means the dog can pick-up an older or “cold” scent better than most breeds. 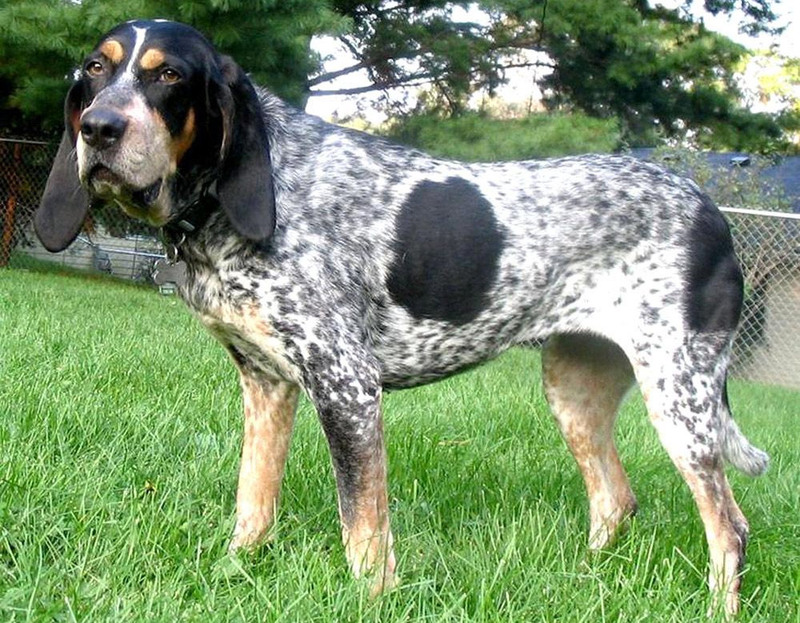 Though much of the selective breeding historically took place in Louisiana, the Bluetick Coonhound is the official state dog of Tennessee. In fact, the most popular Bluetick Coonhound is “Smokey” the official mascot of the University of Tennessee since 1953 when the student body decided they wanted a “live” mascot. The original line of “Smokeys” was supplied by Reverand W.C. Brooks until his death in 1986. His wife, Mildred then carried on the family tradition until 1994 at which time her brother Earl Hudson took over the responsibility. The University of Tennessee is now represented by Smokey IX, who has been their mascot since 2004. The medium sized Bluetick Coonhound is a muscular dog with droopy ears and dark brown adoring eyes. Its short hair is dense and somewhat coarse to the touch though visually smooth and shiny. Like many coonhounds, the Bluetick gets its name from its markings, which with its heavy black speckled pattern, known as ticking, on a white background gives the appearance of being blue. Meanwhile the Bluetick’s head and ears are mostly black while its paws, muzzle, chest and eyebrows are tan. The intelligent Bluetick Coonhound is friendly, easy going, and loving, making it a good companion and devoted family member who easily warms up to strangers only after thoroughly sniffing them to capture their scent. However, it is stubborn and its owner needs to quickly establish his/her role as the pack leader exuding consistent confidence. While typically calm at home, Blueticks are energetic and easily excited outdoors where their tracking instinct kicks in. A hard working, dedicated hunter, Blueticks are muscular and athletic making them skilled tracking and treeing dogs. Blueticks are most happy when working, whether hunting or performing agility. While raccoons are its main hunting game, a Bluetick, with its fearless nature, has also been known to trail larger animals such as cougars. Due to its instinctual tracking, the Bluetick is always alert to its surroundings and cannot be trusted off leash as it may bolt at any time towards a scent, often tuning out its owner’s calls to return. Good with children? Yes, especially older children due to its calm nature though it can adapt to younger children. Good with other dogs? The Bluetick can be dog-aggressive if its owner isn’t a strong alpha leader. Early socialization is crucial. Good with cats? As with Redbone Coonhounds, the hunting instinct is very strong in Blueticks and so it may likely try to hunt smaller animals such as cats and other small pets. It is best to introduce a Bluetick to pets while still a puppy. Easy to train? It can be difficult to train a Bluetick due to its stubborn nature. It is best to begin training from a very early age, gaining the dog’s respect. Patience and consistency are very important when training this breed. Can be left alone? Yes, however it is imperative for the dog’s safety that it is left in a fenced yard as the Bluetick’s treeing instinct could send it wandering if it catches a scent. Barker? Yes, though the bark is more of a loud howl. Hunters typically can identify their Bluetick over others by its distinctive “voice”. Activity level? Daily vigorous exercise is needed. The best Bluetick owners, have a large, fenced yard, and are an active, outdoor family who is able to take their dog on long, brisk, daily walks.